Children with Down syndrome develop motor skills more slowly than many other children. A number of studies have explored their motor development, and a few have begun to evaluate specific physical therapies. It is increasingly recognized that motor skills effect cognitive development. More research is needed to develop and explore effective interventions to improve motor and cognitive development for children with Down syndrome. It is frequently observed that the motor development of children with Down syndrome is delayed in relation to their chronological age. [1, 2] In fact, some studies have shown that their motor development is largely as would be expected for their mental age (which means comparing them with younger children). [3,4] When children with Down syndrome are compared with other children with similar levels of cognitive delay and the same chronological age, their motor development is more delayed even though they have had the same number of years to learn to move. Motor development is complex and controlled by the brain. As babies and children move, from early reaching for a toy, to picking up a cup, using a knife, fastening buttons and writing with a pen (fine motor skills needing hand control) and from rolling, to sitting, crawling, standing, walking, running and jumping (gross motor skills needing balance) the brain is learning how to control each movement more quickly, smoothly and precisely. To control any movement, the brain has to process complex incoming information (for example from eyes, from limbs, from vestibular system) and use this to control movements in real time. Over time, the brain stores ever better motor control plans for each movement as the child practices the movement. Children with Down syndrome may have some physical differences in the resting state of their muscles, in the stretchiness of their ligaments at joints and in bone lengths which affect learning to move but the brain learns to accommodate to these and movement increases strength and encourages development in the muscles and in joint function. Improving movement means providing as much opportunity as possible to practice that movement. A number of studies examine the way in which older children or adults with Down syndrome carry out specific movements and describe their movement differences in detail when comparing them with chronologically age matched typically developing individuals. [e.g.11- 13] These studies are difficult to interpret as differences could be due to less movement experience and less opportunity to practice. Training studies are one way to address this and some training studies do show changes in movement patterns for those with Down syndrome towards more typical patterns. Infants and children with Down syndrome usually receive physiotherapy to help their gross motor development from the early months of life until they are walking. Many children receive occupational therapy to encourage fine motor development. Specific therapies with proven effectiveness such as treadmill training are becoming more widely used. Pereira, K., Basso, R.P., Lindquist, A.R., Da Silva, L.G. & Tudella, E. (2013) Infants with Down syndrome: percentage and age for acquisition of gross motor skills. Research in Developmental Disabilities, 34, 894-901. Frank, K. & Esbensen, A.J. (2014) Fine motor and self-care milestones for individuals with Down syndrome using a Retrospective Chart Review. Journal of Intellectual Disability Research Advance online. Fidler, D.J., Hepburn, S.L. Mankin, G. & Rogers, S.J. (2005) Praxis skills in young children with Down syndrome, other developmental disabilities and typically developing children. American Journal of Occupational Therapy, 59, 129-138. Lobo, M.A. & Galloway, J.C. (2012) Enhanced handling and positioning in early infancy advances development throughout the first year. Child Development, 83, 1290-1320. Libertus, K. & Needham, A. (2014) Encouragement is nothing without control: factors influencing the development of reaching and face preference. Journal of Motor Learning and Development, 2, 16-27. De Campos, A.C. Rocha, N.A. & Savelsburgh, G.J. 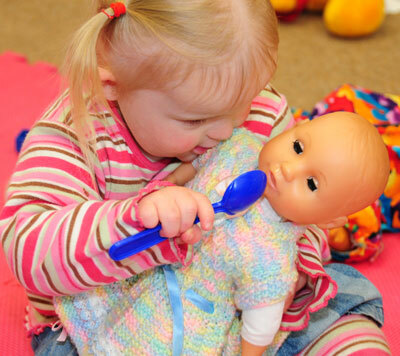 (2010) Development of reaching and grasping skills in infants with Down syndrome. Research in Developmental Disabilities, 31, 70-80. De Campos, A.C., da Costa, C.S., Savelsburgh, G.J. & Rocha, N.A. 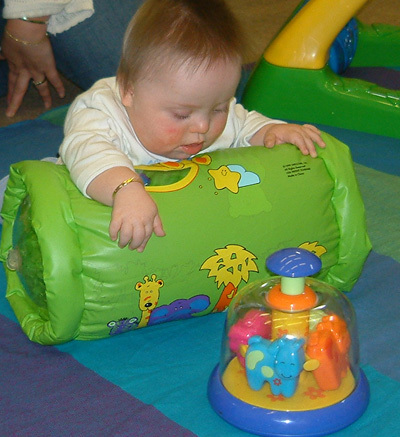 (2013) Infants with Down syndrome and their interactions with objects: development of exploratory actions after reaching onset. Research in Developmental Disabilities, 34, 1906-1916. Leonard, H.C. & Hill, E.L. (2014) Review: The impact of motor development on typical and atypical social cognition and language: a systematic review. Child and Adolescent Mental Health 19, 163-170. Lobo, M.A., Harbourne, R.T., Dusing, S.C. & Westcott McCoy, S. (2013) Grounding early intervention: Physical therapy cannot just be about motor skills anymore. Physical Therapy, 93, 94-103. Vimercati, S.L. Galli, M. Rigoldi, C. & Albertini, G. (2013) Obstacle avoidance in Down syndrome. Journal of Electromyography and Kinesiology, 23, 483-489. Vimercati, S.L., Galli, M., Rigoldi, C., Ancillao, A.& Albertini, G. (2013) Motor strategies and motor programs during an arm tapping task in adults with Down syndrome. Experimental Brain Research, 225, 333-338. Galli, M., Cimolin, V., Ferrario, D., Patti, P. et al. (2013) Quantitative 3D evaluation of step ascent and descent in individuals with Down syndrome - an analysis of a daily challenging task. Journal of Intellectual Disability Research, 57, 1143-1151. Looper, J. & Ulrich, D.A. (2010) Effect of treadmill training and supramalleolar orthosis use on motor skill development in infants with Down syndrome: a randomized clinical trial. Physical Therapy, 90, 382-390.